This week, Marimekko launched its fourth and fifth shops at Crate & Barrel in Los Angeles and San Francisco. The two companies have collaborated for four decades so it makes sense that Marimekko is growing its North American retail presence by launching small shops within existing Crate & Barrel stores. The first shop-in-a-shop opened in SoHo last fall and since then, the company has launched another store in New York City and one in Chicago. On Thursday, we made our way to San Francisco's Union Square shopping district for this city's new Marimekko boutique. The new shops feature an array of Crate & Barrel-exclusive bedding and bathroom products made with Marimekko textiles as well as fabrics by the yard and other products by the Finnish design company. This tabletop display features mugs with Marimekko's iconic Unikko pattern designed by Maija Isola in 1964 as well ceramics with Maija Louekari's black dots Räsymatto design and her blue-on-white Siirtolapuutarha pattern, among others. The three-level Crate & Barrel was draped with bright banners made of colorful Marimekko fabrics. 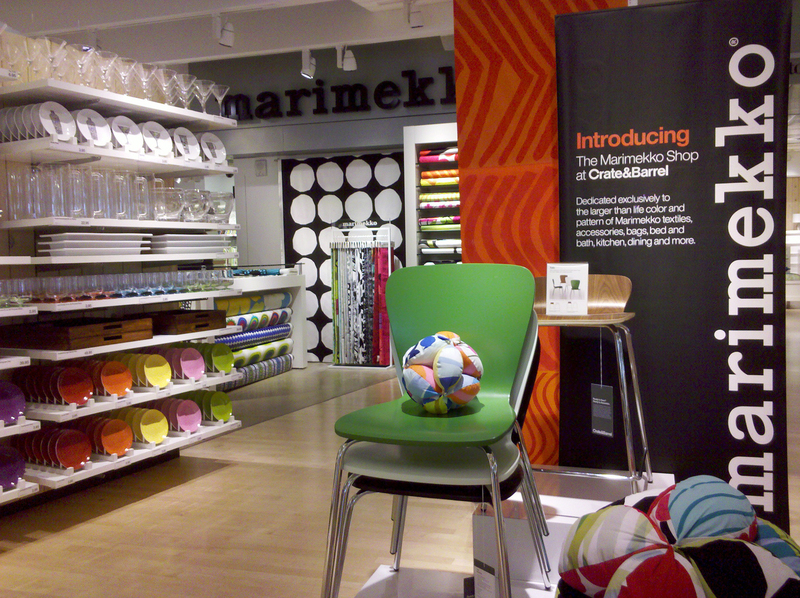 The Marimekko shop-in-a-shop is located on the second floor of the downtown San Francisco Crate & barrel. Items for sale range from tableware to bedding, bath linens, totes, napkins, notebooks, and more. Displayed between a mug featuring Miina Äkkijyrkkä's Iltavilli design with a young calf and a bowl with Maija Louekari's colorful Räsymatto pattern is Anu Penttinen's Sukat Makkaralla glasses, designed in 2010 and available in a range of colors. The shop sells water-resistant, draping, and seasonal cotton fabrics by the yard. At the opening, a craft table was set up for making necklaces with fabric scraps. Marimekko asked a number of its designers to create DIY projects that use leftover materials. The book, titled Surrur, will be available in coming weeks. The word surrur represents the sound of a sewing machine. Check back to dwell.com soon, when we will give you a look inside the book and highlight some of its DIY projects. Vuokko Eskolin-Nurmesniemi designed the Iloinen takki (Happy Coat) in 1960. She originally designed it for adults, thinking it "would be nice to have a dress with pockets in which you could hide away little presents and messages received from the one you love," Marimekko says. Shown here is the child version. Marimekko plans to open 17 more shops at Crate & Barrel stores around the country within the next three years. It will also launch its standalone flagship store in New York. In the meantime, you can shop the Marimekko line at FREE app from iTunes, friend us on Facebook, or follow us on Twitter!